Ukraine's decision to suspend preparations for signing an association agreement with the EU has provoked a storm of emotions in certain political and expert circles. The above statement is not as paradoxical as it may seem; it is not a typo, a mistake or a sophism. Although, at first glance, it is indeed difficult to believe: Ukraine's decision to suspend preparations for signing an association agreement with the EU has provoked a storm of emotions in certain political and expert circles. Following the Eastern Partnership summit in Vilnius, there appeared talk of a geopolitical "zero sum game" and of Russian pressure on Ukraine, further contributing to a rise in tensions. 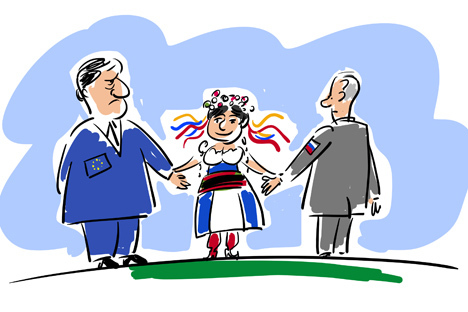 The conclusion that "the Ukrainian factor" will have a negative effect on Russia-EU relations was all too evident and established itself in the minds of some analysts. However, such "compelling" logic is false and evil in its conflict-generating potential. In order to understand this, all one has to do is to turn to reality. The reality is that Russia-EU, Ukraine-EU and Russia-Ukraine relations - irrespective of the changeable political situation - are relations of long-term strategic partnership. They are valuable by themselves because they meet the interests of our nations. And it is in everybody's interests to develop these relations. The European Union is a key partner for Russia: it accounts for half of our foreign trade. We are interested in taking this cooperation to a new level, through removing visa barriers, promoting trade and investment and boosting political contacts. We hope that this work, which requires considerable effort and patience, will receive adequate support from our European partners. We therefore very well understand and support a similar interest from Ukraine, or any other country, to deepen cooperation with the EU. It is an inalienable and unquestionable sovereign right of the Ukrainian people and their lawfully elected leadership to set the modality, format and characteristics of such cooperation. The intensity, breadth and depth of Russian-Ukrainian ties (in terms of contacts between people, industrial cooperation, trade, etc. within the CIS free trade area) are obvious. Of course, we want to continue to develop this cooperation. Were the established, mutually beneficial ties to be cut, that would have a negative effect on the two countries' economies and would deal a blow to people's prosperity. The prospect of signing an association agreement, including a "deep and comprehensive" free trade area between Ukraine and the EU, to our sincere regret, did not develop into a positive opportunity for making a new step forward in the tripartite relations between the EU, Ukraine and Russia. Instead, it all boiled down to politicizing, to attempts to impose on Kiev a false choice "between Moscow and Europe," and to criticism of Ukraine's sovereign choice in favor of a more detailed analysis of the terms of the association agreement and additional consultations with the European Union, possibly with Russia's participation. Both Ukraine and we need to have a comprehensive understanding of what the signing of the association agreement would mean in practice, in particular in terms of our joint projects and established industrial links. It is also necessary to consider the effect of changing the preferential terms that apply to all members of the CIS free trade area, including Ukraine: it would have been impossible to preserve these conditions unchanged. The issue here is not political but purely economic. The consequences of Ukraine's move from the preferential terms of the CIS free trade area to the most favored nation treatment existing in the WTO (this is not about any deliberate retaliatory measures, let alone sanctions) should be calculated and considered. In view of the above, a natural and positive option would be lo launch a tripartite dialogue between Ukraine, Russia and the EU to have an honest, substantive and respectful discussion of all the existing issues. Sadly, Kiev's proposal to that effect was rejected by EU structures outright, even, it seems, without specific consultations with the member states. The opportunity to turn "the Ukrainian factor" into a unifying element that would allow us to develop modalities for our joint interaction has so far remained unrealized. Still we, like Ukraine, are ready for this work. The ball is in the EU's court. And one more thing: Russia's position of principle consists in recognizing the region that is a neighbor to us as an important positive factor in relations with the European Union. The Russia-EU Roadmap on the Common Space of External Security that was adopted in 2005 states the idea of linking our regional integration processes, which was further developed in the Russian president's initiative to set up a common economic and humanitarian space from Lisbon to Vladivostok. I am convinced that the future lies in thorough joint efforts to link the processes of European and Eurasian integration, which do not contradict but rather complement each other. All the more so since the Eurasian project is fully transparent, is based on WTO rules and largely relies on the European Union's experience. Vladimir Alekseyevich Chizhov is Permanent Representative of Russia to the EU.